Actually, I think genetically engineered yeast to produce milk is a good idea. As long as it's real. 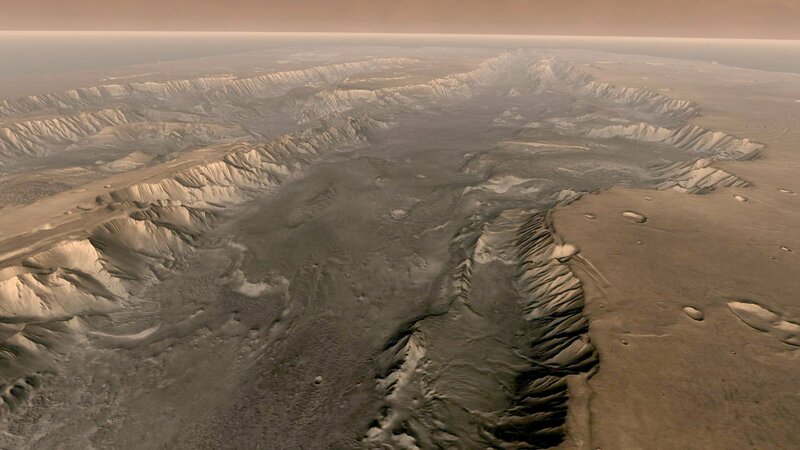 Ancient Lakes on Mars Dried Up Billions of Years Ago, Study Concludes that the cracks identified on Mars's surface last year by the Curiosity rover are indeed evidence of ancient lakes that likely dried up about 3.5 billion years ago. Researchers used the Curiosity rover and data from its many tools, particularly the Mars Hand Lens Imager, ChemCam Laser Induced Breakdown Spectrometer (LIBS) and the Alpha-Particle X-Ray Spectrometer (APXS) to study both the physical appearance and the chemistry of the rock, which is described as no bigger than a coffee table. The analysis revealed that cracks on the rocks were formed by exposure to air, rather than heat or the flow of water. In addition, the shape of the cracks suggests the occurrence of a single drying event on the planet, rather than multiple cycles of the planet getting wet and drying over. The position of the cracks, closer to the center of the ancient lake rather than along the edges, also suggests that the lake levels changed often, rising and falling dramatically over time. "The mudcracks are exciting because they add context to our understanding of this ancient lacustrine system," lead study author Nathaniel Stein, a geologist at the California Institute of Technology in Pasadena, said in a statement, referring to the ancient lake system on the planet. Scientists have known of the existence of ancient water on Mars for years. A 2015 NASA study that measured water signatures in Mars’ atmosphere suggested that ancient oceans may once have had more water than our own Arctic Ocean. However, because the planet has less gravity and a thinner atmosphere than Earth, this water evaporated into space over the course of several billion years. Water still exists on Mars in the form of ice. In 2015, NASA scientists found a slab of ice just beneath Mars' surface that was estimated to be as big as California and Texas combined. Some have even suggested that there may still be liquid water flowing on Mars. I read my post #1 and your post just before this. Interesting. I think that their assertion can be taken largely seriously. I do think that for some reason, and they say 3.5 billion years ago, the Martian atmosphere dissipated to the point that planet wide liquid water became unlikely. They still seem to suggest evaporation to space. Maybe. Still there are those who say that the Mariner rift valley shows evidence of being filled with ice with a thick soil layer over it. I could go on. My point though is while I support the material of your post rather strongly, I don't think we have enough information to prove that that ancient ocean of the Northern hemisphere including the Mariner rift valley did not just freeze over, and is now covered with a very thick layer of regolith. I did not think that could be possible before, but Utopia planetia apparently is stable, with a layer of ice several hundred feet thick with covered with dirt and rock 3-33 meters thick??? So, I say, I just am not sure. But I agree that the atmosphere dissipated by some method, either to space or to go underground as clathrate in the ice, if major seas, or wet based glaciers were present prior to the atmospheric collapse. A latest thing I have seen about the moons of Mars, is that they were formed by the impact of a dwarf planet with Mars. This supposedly created several moons, and the largest have already crashed back into Mars. Still I think they indicate that it happened very early in the history of Mars, not 3.5 billion years ago. If it was 3.5 billion years ago, I would suppose that the Martian atmosphere would have gotten expelled, by an iron atmosphere around Mars. But then why would Mars have significant water??? So, probably not the answer. I am going to leave it alone other than to agree that the atmosphere dissipated, most likely as they seem to indicate ~3.5 billion years ago. Not all the water dissipated. In fact it may be that not a huge amount of it left Mars. Or perhaps much did. Without more information I cannot know. This I have though which could be useful, to argue for a minor occasional role for liquid on Mars, if a special event were to happen. I large impact. And eruption of significance. Or, the axis of Mars tilting so that the North Pole, South Pole, and Equator receive approximately the same amount of energy from the sun on an annual basis. This assertion has to do with the freezing point of CO2. If no place on the surface of Mars would be cold enough to permanently capture CO2 as ice, the atmospheric pressure of Mars would rise to an average of 11 mb. This assertion is based on the amount of permanent CO2 ice which is said to be found in the South Polar ice cap of Mars. 2) Temporary water streams from snow melts. Temporary streams in Antarctica do not even require temperatures of the air above freezing. If strong sunlight is present such melts happen in Antarctica even when the air temperature is somewhat below freezing. At the equator of Mars, you might get something similar, but it would be daily perhaps most likely just after noon time. Temporary streams might fill ponds, or even small lakes. These bodies of water would be ice covered however. The ice would also tend to sublimate at a high rate. However, with dust storms the ice might get covered with a protective layer of dirt, which would buffer the temperatures experienced by the ice below, and reduce the highest temperatures experienced. So, I am saying that as a whole most likely liquid water stopped occurring in significance on the surface of Mars 3.5 billion years ago as your post seems to state. However I make some exception for periodic and localized events of melting of less significance, and most likely of a temporary nature. I have given a somewhat upbeat notion of temporary and local water on Mars in post #53, which I think might happen in an ideal situation of the tilt of the planet, where the Equator, South Pole, and North Pole receive sufficient warming, to prevent large scale CO2 ice to persist. However I want to say that I think that conversely, if the poles were to be for period of several million years not tilted much at all, then the conditions on the planet might be lethal to life. That is in that case CO2 freezing in any shadows of craters, or perhaps even just on the polar axis of North and South, might not thaw much at all ever during that period. So, under those conditions, what if the atmospheric pressure of Mars was largely sustained by Nitrogen and Argon. Would it even be say 5% of what it is now? Well even 10%, 25%??? Well under those conditions, it would think that much water moisture in the soil and any presumed aquifers would migrate to the poles as well. The aquifers would become extremely salty, very likely too salty for life, if they are not already now. (This notion of too salty aquifers is one I acquired from Josh in the past). So, my point is that even microbes on Mars in deep aquifers might be very challenged for survival due to the wandering of the Martian poles. I think that Mars provides it's own extinction episodes by this method. Mars may have been alive to start with say for 1 billion years, or a little more, but I think it likely that it has had total extinctions repeatedly. It may have had life restarted several times by panspermia, but I expect that each episode of life was followed by a total or nearly total extinction. The one exception I might provide would be something very deep down that relies on the production of Hydrogen by radioactive decay. On Earth this is seen in South African mines, maybe 3 miles down. But that would also require water that is not so briny that life can't make it. Maybe water placed in those deeps before the atmosphere collapses. But of course I don't know really. To find it you would really need to go down deep. It would not make sense to do so unless you found fossil evidence of previous life on or near the surface of Mars prior to that effort. I think Mars is totally or largely dead. Venus? Actually I think there may be serious chances of life.